I’m very sorry guys, I just had to do this again. 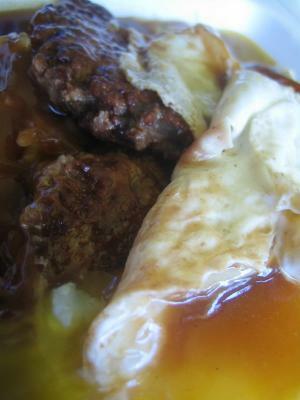 I woke up this morning craving for a loco moco, not just any loco moco… it had to be a Blane’s loco moco. I’ve featured their loco bowl in the past at the Industrial location, but this time I got the loco plate at the Downtown location. I was thinking of getting a mix plate with katsu for sake of variety, but I could not deny my loco moco craving (sorry kelly!). There must be something in the gravy that makes it addicting. The plate ($6.25) is a double loco moco with mac salad and miso soup. It’s a small price to pay for a happy stomach all day long. 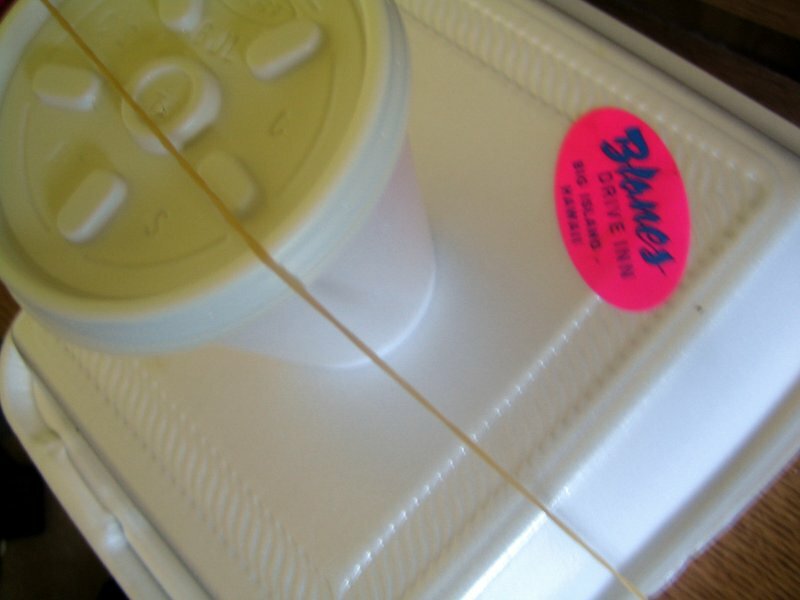 All of their take-out plates are served this way, with a styrofoam cup of miso soup anchored to the top of the plate with a thin rubber band. Brilliant idea, I think! 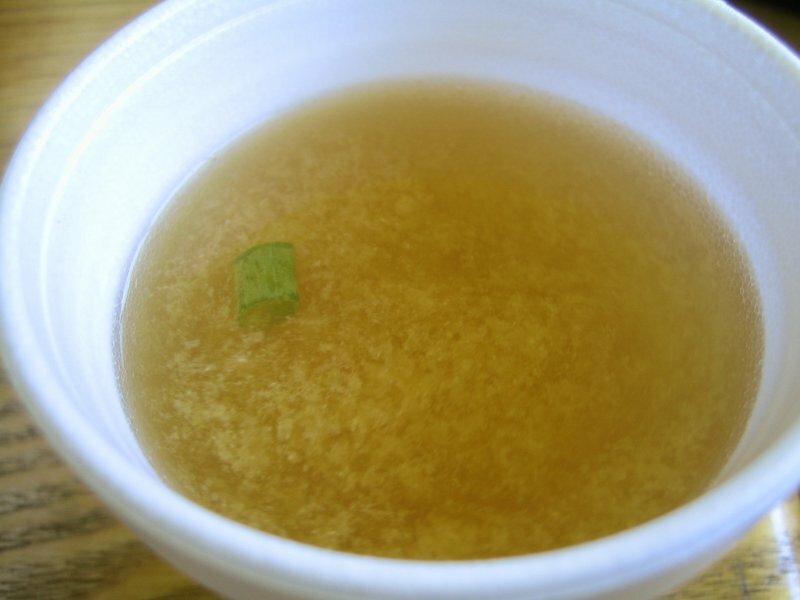 The miso soup looks like it could fall easily, but the rubber band actually does support it fairly well and can withstand the bumps and turns on the seat of my car. And without further ado, here it is in all it’s gravy glory! This loco may be even a little better than the Industrial location, based on this experience. Or maybe it was because I was craving it so much? 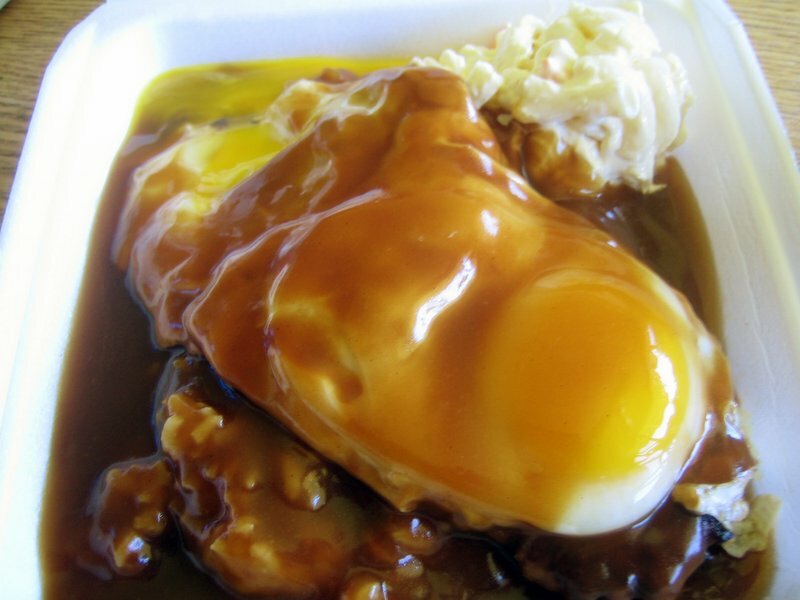 In any case, the loco moco plate is just amazing. The two burgers were very tender and had a great taste; gravy was plentiful and soothing to the soul; eggs were well cooked; mac salad was good and mayonaissey, which went really well eaten with the loco moco.. and the miso soup was nice for in between bites. This entry was posted by James on Saturday, August 27th, 2005 at 12:22 pm	and is filed under Hilo, Loco Moco, Restaurant Reviews. You can follow any responses to this entry through the RSS 2.0 feed. You can leave a response, or trackback from your own site. Woooo Ba-by – This looks like the poster child for locos’ everywhere! wow brah…da buggah does look ONO! da eggs look supah runny brah! an da gravy looks like its sticking to everything. WHew! I hope you wen get one fruit punch to wash em down with….an I still waiting for some katsu brah! brah….i gotta diagree wit da fried rice brah…I telling you hilo lanes (as i remembah) wen get da most ONO fried rice in town! If you no believe…you gotta go try um bruddah! An no foget da fruit punch eh! Kirk, yup, dis is da loco of da locos!!! i wish they freeze dried these things – i’d send you one if the did! kelly, no worries, katsu soon! and thanks for da fried rice recommendation… i hope dey still get good fried rice over dea at da lanes.. when was dat u went go? was maybe 5 -6 yeas ago brah…..an all da time back in da day…..brah….fried rice was winnas! 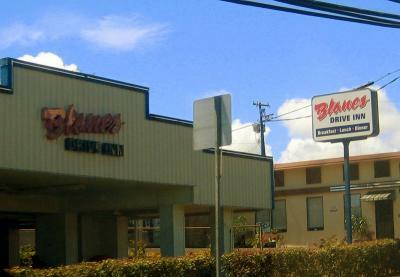 blane’s also has the BEST boneless chicken, ever! 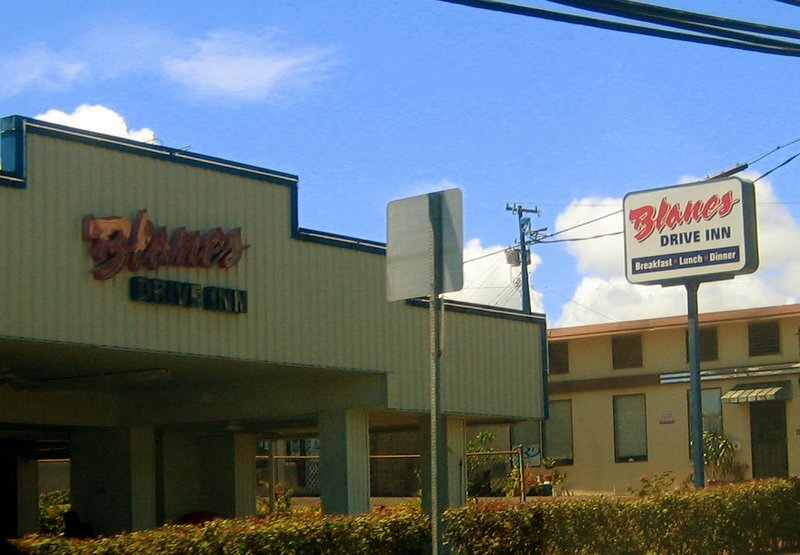 Blane’s Drive Inn has four convienent locations to serve you all now. 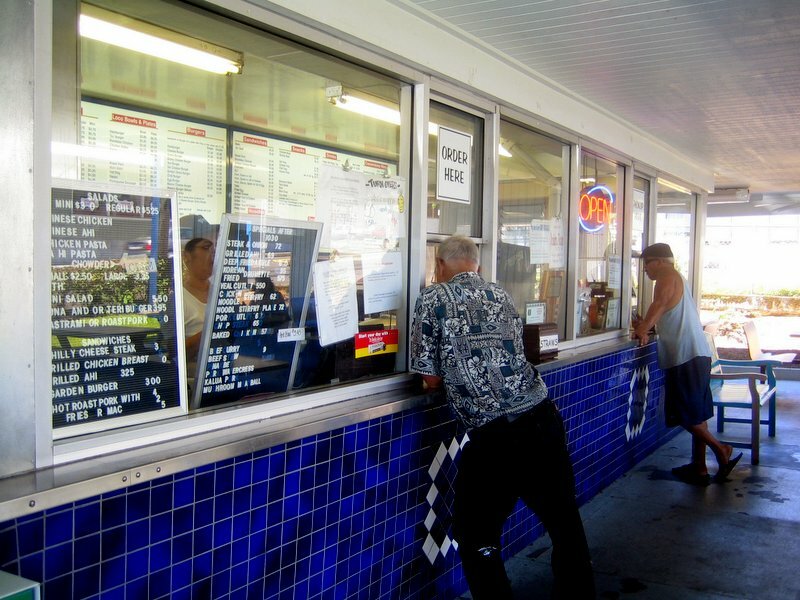 Honoka’a – located in Honoka’a town right across of the 76 gas station. ORCHIDLAND – Will be open for business from 1/20/06 Their hours of operation is Mon~Fri 5am till 10 pm. Sundays – 6am- 9pm. Located on Orchidland road, right next to Wiki Wiki mart and gas station. Just to let you all know… We now have customer service survey’s available at all locations. So we can serve you better. dat loco looks so ono, i tink i goin cry cuz i neva had one fo so long. right now, i stay in north dakota trying fo get my degree. i remembah blanes’ boneless chicken was one winna, da loco was awesome too and for da best compliment to any blanes grinds, the mac salad…ho, broke da mouth! tanks fo reminding me of home guys. eat up! I know this is an old post…but I couldn’t resist. Not that I needed a reason to take another Hawaiian vacation, I now have a mission. My GAWD man! Y’all are soooooooooooooo lucky to have this place all good to go. Mel, any possibility ya might open a convenient location here in San Diego? Please!? Guys just letting you know that th hamburgers are usually a couple days old sitting outside before they serve it. You maybe lucky to have one that has accidently been dropped and served to you. trust me i work here. the katsu is deep fried 2x usually a week old, the fish is purple and goozy when they cut it specially the mahi mahi and ahi tuna, everything is DEEP FRIED.. most of the time the micros that work there dont wash thier hands and also spits in the trash thats close to the grill. yuck!! there was also an incident when we had to use mouse traps in the kitchen. well im just letting you folks know wat really goes on in the kitchen. trust me. i work in the industrial area. number 808 935 2259. mahalo for reading. i used to work here at blanes. the people dont know how to wash their hands. i worked there for one week till i quit in disgust. l should say lM impressed with ur posts! Hey, great piece you have here, think l came across it on Google but lm not sure nowanyway, ill check back again! are guests allowed to web page here? No wonder why http://www.12latest.com?Cher :^)recommended ur posting. Up-to-date Cher monitoring for free!!! l totally like it! Increasing breast size, therefore, is easier and secure. I’m fortunate that I discovered this site, simply the best info that I was looking for! Neat thanks for posting! btw are there feeds to your Tech Software News Blog? I much like the valuable information and facts an individual provide within your reports. I will save your blog post as well as have a look at one more time in this article usually.. Home,Vitamins,herbs,extracts,Wise-freeze-dried-Survival-Food,Perfume,Gold,Diamond,Jewlery.charm,pendant,ring,wedding,bracelet,neklace,wice We’re rather a number of I’m going to study numerous innovative goods right the following! Enjoy for the!